In a game with two very different halves, Williston Hockey (3-5-0) sustained its early lead despite Winchendon’s (3-5-2) three second-half goals. This game secured Williston a 3rd place finish in the St. Seb’s Holiday Tournament. After losing to St. Andrew’s on Friday, the Wildcats defeated Northwood on Saturday and Winchendon today, December 21st. The Wildcats scored three goals in the first half, while the Wapitis were never able to fully break through Williston’s defense. Senior defenseman Jo Labrecque gave the Wildcats a 1-0 lead when he scored on a backhand shot off a rebound. In his second year on the team, Labrecque leads Williston’s defensemen with three goals. Labrecque was awarded the game puck by Assistant Coach Kevin Kelly, given to a player after each team win for an outstanding performance. Senior forward Jack Gethings scored his second goal of the weekend 11:30 into the first half to give the Wildcats a 2-0 lead. With just under one minute to go before halftime, senior forward Jared Karas put Williston up 3-0. A rarity, the Wildcats didn’t go to the box once during the first half. Winchendon went twice in the first twenty-five minutes. A sign the second half wouldn’t go the Wildcats’ way was when Williston went to the box just twenty-seven seconds into the period. The Wildcats would be penalized four more times in the game, and the Wapitis capitalized on one of the power plays. Winchendon scored goals 2:26 and 17:42 into the second half to cut Williston’s lead to one. Up by one with seven minutes to play, sophomore forward JoJo Carbone skated with the puck down the right side of the rink and fired a shot past the Winchendon goaltender. This very timely goal was Carbone’s second of the tournament. The Wapitis added a third goal with 3:29 remaining and pulled their goaltender, but an untimely penalty gave the Wildcats an advantage for the final minutes. This was the team’s second consecutive win after it snapped its five game losing streak yesterday against Northwood. About getting the season back on track, senior forward and team captain Tyler Scroggins said, “We had a little bit of a rough skid at the beginning, but getting back on track is going to set the tone for the [New Year’s Showcase] and the rest of the year. Williston junior goalie Shane Mason stopped 32 of 35 (.914%) pucks that came his way. Junior defenseman Brad Budman was out for his third consecutive out with a shoulder injury. The team has almost two weeks off before returning to practice on January 1st. 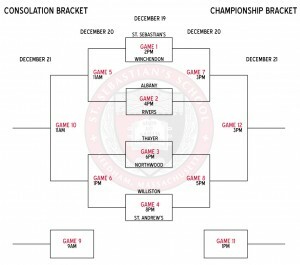 The Wildcats will compete against St. Sebastian’s and Nobles that weekend. Down by one goal with just over six minutes to play against Northwood (1-3), Williston Boys Hockey (2-5-0) changed the course of the game and its season with four unanswered goals. This game broke the team’s five game losing streak, which started back on December 3rd versus Kimball Union. Northwood took a 1-0 lead midway through the first half, but sophomore forward and the team’s leading scorer with five goals, Nick Schofield, tied the game 2:29 before halftime. Northwood took a 2-1 lead seven minutes into the second half, but Williston’s offense took over after that. At 6:04 of the second half, senior defenseman Chris Dumont forced the puck into the net from a very odd angle near the goal line to tie the game at two. Williston Head Coach Derek Cunha said about this goal, “It was one of the breaks that we probably haven’t gotten in a while. Every once in a while you need a good break to change course. Just over one minute later, senior forward Jack Gethings gave the Wildcats a 3-2 lead when he fired a shot from just outside the face off circle. Sophomore JoJo Carbone gave the Wildcats an insurance goal with four minutes remaining. This was Carbone’s first goal in a Williston uniform. Junior Jack Kelly scored an open net goal with 1:13 on the clock to seal the win. Shane Mason ’16 made his sixth start in net for Williston. After a few tough starts against some of the top teams in New England, Mason got into a rhythm, displaying why he is the team’s starter. He stopped thirty of thirty-two shots. Northwood put continuous pressure on Williston’s defense in the second half, but Mason didn’t allow the opponent to ever get a two goal lead. This game was part of the St. Sebastian’s Holiday Tournament. Tomorrow, the Wildcats will take on Winchendon (3-4-2) at 11 a.m.
One of the best teams in Midwest Prep Hockey, St. Andrew’s College (16-3-1) played at a very high tempo, which caught Williston (1-5-0) flat-footed. The Saints capitalized on the Wildcats’ defensive lapses. With three goals in the game’s two halves, the Saints delivered Williston its fifth straight loss. This game was part of the St. Sebastian’s Holiday Tournament, which the team competes in annually. After a home-opener victory back on November 22nd, the Wildcats have not won since. The previous four opponents, Kimball Union, Salisbury, Cushing, and Gunnery, are all top ten New England Prep teams. Down 3-1 at halftime, the game was still very much in reach for the Wildcats. That changed early in the second half when the Saints scored three goals in the period’s first five minutes. St. Andrew’s senior forward Justin Fregona, who has committed to UNH, scored two goals for the Saints. The game was played with two twenty-five minute halves, an unusual format. This meant that the game was four minutes shorter than what the Wildcats generally play with three eighteen minute periods. As Williston has shown in parts of each the team’s five losses, there were long stretches, especially in the second half, when the Wildcats played with the Saints stride for stride. After the game, both players and coaches expressed in the locker room that win or lose, the team will play together for the rest of the season. So, the attitude each player has during each game, is critical for the rest of team. The Saints have three players, two forwards, one defenseman, who have committed to Division 1 schools (Harvard, University of New Hampshire, RPI). One positive of this game was that the Wildcats were the less-penalized team. The Wildcats went to the box five times, the Saints six. Williston’s first goal was scored on the power play. Sophomore Don Battimelli got his first start in net for Williston. He made strong saves early for the Wildcats, but the Saints’ pressured attack, with Williston’s defensive mishaps, became too much to handle. The team’s usual starter Shane Mason ’16 replaced Battimelli after St. Andrew’s scored its fifth goal. With just under three minutes to play in the game, senior defenseman Chris Dumont blocked a shot in the defensive zone, which gave him a breakaway and he scored a shorthanded goal on his own rebound. This goal made the score 6-2. This loss puts the Wildcats into the tournament’s consolation bracket. Today, Saturday, the team will face Northwood at 1 p.m. Yesterday, Northwood (1-3-1) was defeated by Thayer 4-2. Northwood sophomore, Kaden Pickering (#17), has committed to play Division 1 hockey at St. Lawrence University. Updates on the tournament are available on the team’s Twitter feed @WillistonHockey. My first year at Williston was also Coach Cunha’s. I was only 15 years old, and had been originally recruited by the former Head Coach, Brock Dunn. Williston didn’t have the best team in those days, sporting a 2-23 record in ’05-’06, the year before both Coach Cunha and I joined the program. The coaching change came as a complete surprise to me. I had no idea Mr. Dunn wouldn’t be the head coach when I arrived at the school, and as you could imagine, I grew pretty nervous. I went to the school with hopes of someday playing division 1 hockey and now the coach who had brought me there was no longer coaching. What would this mean for me? Anyone who’s played at “Willy” in the past decade knows this mantra well, but it’s more than just a sign in the locker room. Better Every Day encapsulated every fiber of my being. Playing hockey at Williston taught me how to strive. By my junior year, I began to really thrive in the classroom as well as socially. It was because the hockey program helped me make a conscious effort to be a better version of myself every single day; as a hockey player, a student and a person. When I eventually got to Babson College to play D-3 NCAA hockey, it was pretty intimidating. I was one of 15 freshmen going for 12 spots, and even though I knew I’d be on the team, everyone in my recruiting class was also one of the best players at their school, and we all wanted the most playing time. After four years at Babson, I had played 108 games, amassing 7 goals and 35 assists for 42 career points. Only one other player in Babson history played more games for the program than I did, and he was my D partner. We won two ECAC East conference championships, and senior year had the lowest Goals Against Average in school history, a stat defensemen take pretty seriously. College was tough. Babson was an intense academic school, and classes were always hard. A lot of guys on my team couldn’t handle it. Some of them focused completely on hockey and played a lot, but still can’t find jobs because they couldn’t bear down in the classroom. Other guys were so focused on academia that by the time they graduated, they were earning close to no ice time because their games had just gone to hell. I was able to survive, because I had that Better Every Day mantra stuck in my head. I still do. A lot of people are afraid of change, but it’s literally the only possible way to improve yourself; to change. Williston Hockey and Coach Cunha taught me that the best version of yourself is not who you are but who you can be, and you need to make strides towards being that person everyday. When I was at college, Williston felt far in the past. It wasn’t always easy to keep in touch with people, and the long semesters in Western Mass felt like a decade ago. But now that I’m out of school, out in the world, working and living, I tend to look back to the Williston days more than my college days. They truly are the formative years, and if you can grab hold of your time at Williston and leverage it into a bright future, with conscious effort to improve yourself, the possibilities are endless. On Friday, December 19, Williston Boys Hockey (1-4-1) will travel to eastern Massachusetts to compete in the St. Sebastian’s Holiday Tournament. This tournament will be an opportunity for the Wildcats to get their season back on track after losing four straight games, all against top ten New England Prep Teams. While the first two losses of this stretch, against Kimball Union and Salisbury, were close losses, the Wildcats were outscored a combined 14-5 in the last two games against Cushing and Gunnery. At 8 p.m. tomorrow (Friday), Williston will face St. Andrew’s College, one of the top teams in the in Midwest Prep Hockey. The Saints, based in Aurora, Ontario, Canada, have already played a hefty schedule of nineteen games up to this point, amassing a 15-3-1 record. Senior J.D. Falconer (#5) leads the team in goals (22) and points (33). The team’s starting goaltender, Mathew Galajda, has played 758 minutes this season, putting together a stellar .928 save percentage. As shown in the bracket, should the Wildcats defeat St. Andrew’s, they would continue in the winner’s bracket and face either Thayer (4-0) or Northwood (1-2-1) on Saturday. A loss would place Williston into the loser’s bracket playing one of those teams. Stay tuned to the team’s Twitter feed (@WillistonHockey) for game updates. The good news for Williston Boys Hockey (1-4-0) is that one of the toughest stretches of the season is over. The bad news is that the Wildcats finished this stretch without a single point in the standings, losing all four games. Williston’s last four games have been against Kimball Union, Salisbury, Cushing, and Gunnery. All of these teams were ranked in the top seven of USHR’s New England Prep Preview; Salisbury and Gunnery were one and two, respectively. 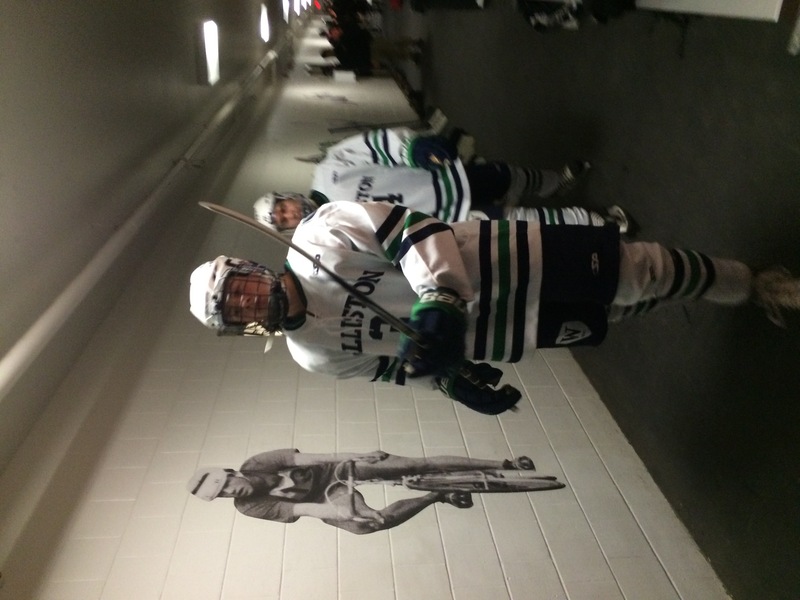 On December 13th, the Wildcats wrapped up the stretch against Gunnery (3-2-0) at Lossone. Saturday was also alumni day with former Williston hockey players returning to play a game and watch their former teams compete. Gunnery built an early 2-0 lead that was erased in the final 3:15 of the first period. Junior forward Jack Kelly and senior forward Rourke Ferguson scored. After a first period in which the the Wildcats trailed by two, but clawed back to tie the game, the Highlanders took control of the game in the second period scoring two unanswered goals. Gunnery added two goals early in the third period to cushion its lead. The third period involved sloppy play by both teams resulting in eight combined goals, three for Williston. In the last ten minutes, Jack Gethings ’15, Brandon Bork ’15, and Nick Schofield ’17 added goals for the Wildcats. Junior goaltender Shane Mason was pulled after Gunnery scored its sixth goal during the third period. 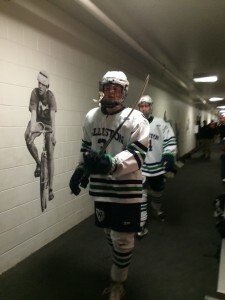 Sophomore Don Battimelli replaced Mason for his first appearance in a Williston uniform. In the past two games, the Wildcats have allowed fourteen combined goals. The Wildcats have their work cut out for them now three games below .500. However, last season Williston didn’t win their games against Kimball Union, Salisbury, and Gunnery and those games did not define the team’s season. From the start, this game was played at a very high speed and level of physicality. Seventeen penalties were handed out in the game. For the first time this season, the Wildcats were the less penalized team with the Highlanders going to the box eleven times. Schofield ’17, still recovering from a shoulder injury that keep him out of the Cushing game, was available in a limited role for the Wildcats. For the final two periods against Gunnery, junior defenseman Brad Budman was sidelined with an upper body injury. This was Williston’s last game before the holiday break tournament and showcase. 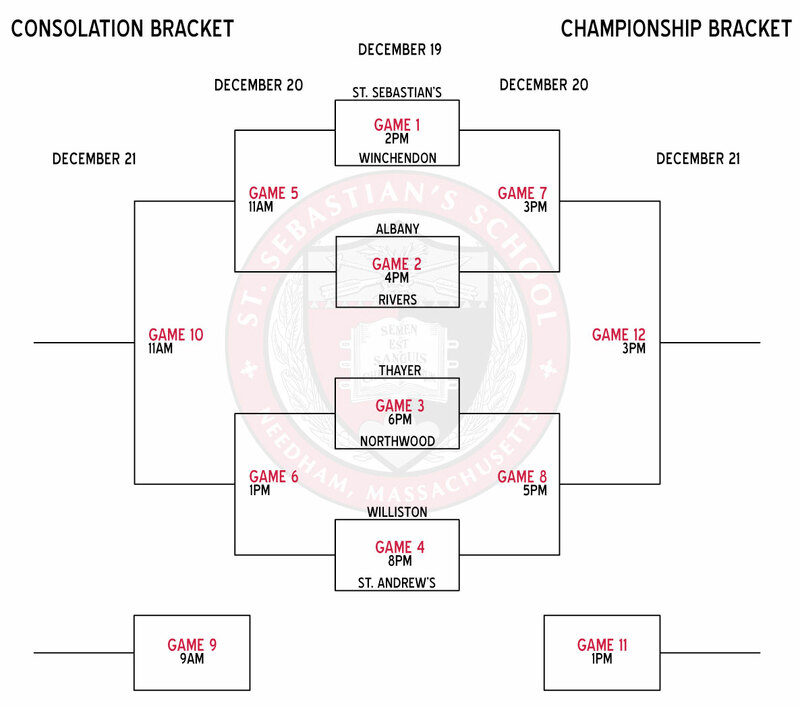 After practices Monday through Thursday, the Wildcats will face St. Andrew’s, a top Canadian team, in the St. Sebastian’s Tournament on Friday. In the next few days, stay tuned for a weekly preview, which will take a look at the season, so far. Also, stay tuned for a guest post from a former Williston Hockey team captain. Every loss gives a team a sense of dejection. It’s tougher when the game appears to be out of reach with a third of the game still sleft to play. Down 5-0 heading into the final eighteen minutes, Williston Boys Hockey (1-3) prevented the Penguins of Cushing Academy (5-0-1) from adding to their lead. During no stretch of the game was Cushing dominant, unusual when a team wins by such a large margin. Cushing made the most of its opportunities and punished the Wildcats for their occasional lapses. Cushing went to the box eleven times on Wednesday, but the Wildcats were unable to get any pucks past the Penguin’s goaltender. Cushing senior Joey Daccord shut out the Wildcats stopping all 32 pucks that came his way. One of the best goalies the Wildcats will face, Daccord has a .940 save percentage, giving up just six goals in his first five starts this season. This is the Wildcats’ third consecutive loss, all against top 10 New England prep teams. This may prove to be the toughest stretch of the season, which will culminate on Saturday in a home against The Gunnery. Williston was without top line forward Nick Schofield. Sidelined with a shoulder injury, Schofield, a sophomore, is the team’s leading scorer with four goals. With the exception of Cushing’s fifth goal, which was scored shorthanded, all of the team’s goals were scored by the team’s top line of David Cotton-Bailey Conger-Jake Simons. Cotton and Conger have committed to play Division 1 hockey at Boston College and St. Lawrence, respectively. Each of the three players on this line scored, with Cotton providing two goals. Williston senior goalie Elie Small replaced starter Shane Mason ’16 after the second period. Small displayed poise in his first regular season game and prevented the Penguins from adding to their lead in the final eighteen period by making ten saves. The Wildcats have the chance to redeem themselves on Saturday when they take on the Highlanders at Lossone Arena. This will be the team’s last game before the holiday break, during which the team will compete in a tournament and showcase. This Saturday’s game at 6:00 p.m. will be preceded by the annual Williston alumni hockey game at 1:30 p.m.
Last week, Williston Boys Hockey (1-2-0) picked up no points in the standings, losing to two of the top prep hockey teams, Kimball Union and Salisbury. Williston Head Coach Derek Cunha often tells the team that he does not take “moral victories,” but last week demonstrated that the Wildcats are capable of competing against the best teams. In both games, the score was tied at one point during the third period. This week isn’t any easier for Williston. The Wildcats will face Cushing Academy and The Gunnery, two teams ranked in the top ten of USHR’s New England Prep Preview. Two wins this week would get the Wildcats’ season right back on track and establish them as one of the teams to beat in New England. Wildcats vs. Cushing, Away Wednesday, December 9, 4:45 p.m. The Penguins (4-0-1) have yet to lose in their five games this season. The Penguins are looking to repeat their successes of the 2013-14 season in which they went 22-10-0, losing in the Elite 8 playoffs to Salisbury in overtime. The Penguins did lose two players from last year’s squad who have gone on to Division 1 schools. Cushing returns two players, junior forward David Cotton and Bailey Conger, who have committed to Division 1 schools Boston College and St. Lawrence, respectively. This season, Cotton leads the Penguins in goals (5), and Conger leads in points (10). Senior goalie Joey Daccord has gotten the majority of the playing time, starting four games, with a .921 save percentage. Wildcats vs. Gunnery, Home, Saturday, December 13, 6 p.m. Updates for every game are available via the team’s Twitter feed (@WillistonHockey). Until time ran out, for each Salisbury (2-0-0) goal, Williston (1-2-0) had a response. Down 3-2 with under nine minutes to play, junior forward Jack Kelly skated down the right side of the rink and fired a shot past the Crimson Knight goaltender to tie the game. And when it appeared the game was headed for overtime, an unlucky bounce off an official’s skate gave a Salisbury forward a shot between the two face off circles that rocketed to the top left corner past Williston’s goalie Shane Mason’s blocker. This loss was the Wildcats’ second consecutive loss against top prep school hockey games. In USHR.com’s 2014-15 New England Prep Preview, Salisbury was ranked number one, coming off a one-loss season in which it won the NEPSIHA championship. This game against the Crimson Knights was Williston’s first home loss of the young season. Mason ’16, who has started each of the three games this season, saved 33 of 37 shots that came his way. Besides Salisbury’s flukey first goal, Mason appeared to be screened for two of the Crimson Knights’ next three goals. Throughout the game, Salisbury displayed its speed, which resulted in numerous odd man rushed and a few breakaways that Mason turned down. Williston senior forward Jack Gethings scored his first two goals of the year to keep the Wildcats in the game until Kelly ’16 added the team’s third goal of the game, his first of the season. From the start, in a game in which neither team scored two consecutive goals, the play was very fast moving and aggressive, bordering on dirty at points. There were a combined 13 penalties in this game, seven against the Wildcats. This is the second time in the first three games the Wildcats have gone to the box at least seven times. This was dangerous against a Salisbury team with a very potent power play, but it capitalized on just one of these opportunities. Stay tuned for a weekly preview of next week which will include games against Cushing and Gunnery. Going into the third period tied at three, Williston Boys Hockey (1-1-0) gave up two unanswered goals to Kimball Union (KUA) (1-0-0) to suffer its first loss of the 2014-15 season. Despite a slow a start in which Williston gave up a goal just 1:30 into the game, the team settled down to play a competitive first period. In the second period, Williston responded with three goals. Within three minutes during the second period, five goals were scored resulting in a 3-3 tie. At 10:41, senior forward Brandon Bork tied the game with a backdoor rebound goal. Senior forward Rourke Ferguson and senior defenseman Chris Dumont were credited with the assists. During the next 2:38, KUA scored twice to take a two-goal lead. KUA’s second goal was a shorthanded goal scored by senior forward Jack McCarthy who has committed to play Division 1 hockey at Brown. Seventeen seconds later Williston junior defenseman Brad Budman scored his first goal of the season to cut KUA’s lead to one. Ten seconds later, sophomore forward Nick Schofield beat the KUA goaltender to even the game. This was Schofield’s team-leading third goal of the year..
KUA outshot Williston 32 to 28 (numbers are unofficial). Williston junior goalie Shane Mason made his second start of the season. Mason denied numerous odd man rushes and breakaways, especially in the third period after KUA took the lead. He held off the opponents’ attack long enough for Williston to create scoring opportunities, but his teammates were unable to capitalize. Williston was given seven power plays this game, not scoring on any of them. KUA made the most of four man advantages, scoring two goals. The Wildcats sported new away game uniforms (pictured below). Williston sported new white away game jerseys.